David Linthicum recent wrote an article that got me thinking. In his article, In the cloud, you don't need a college degree, he made the simple point that employers need cloud computing skills. It doesn't matter where prospective employees get those skills. It matters that they have them, and can apply thing to implement cloud solutions and solve problems. He made the point that we are in a Cloud IT Professional seller's market. In this article, I'm going to answer both those questions and talk about how cloud IT training, and certification can be a win-win for employees and employers. I'll also talk about why both might want to think about cloud certification sooner rather than later. Gartner forecasts that cloud computing, in all of its different iterations will grow 18% in 2017 to $246.8 billion in total worldwide revenue. Cloud skills are in high demand. The RightScale State of Cloud 2017 report, showed that cloud security and controlling cloud spend tied with lack of resources as the top three cloud computing challenges organizations face. The report also made clear that multi-cloud deployments are now the defacto standard. With organizations selecting multiple cloud providers, needing to secure those services and infrastructure while managing costs, the complexity of cloud computing environments is not going to decrease anytime soon. Cloud IT certifications have always offered great pay, but today, if you have cloud computing skills, it's definitely a seller's market. While it's a seller's market for cloud IT Pros, the current cloud revolution is changing the landscape for traditional IT Pros. As more services move off-premises, the need for traditional IT Pro skillsets will diminish. IT Pros that aren't trained or experienced in deploying, managing, and integrating cloud computing solutions will find it more difficult to find a decreasing number of jobs. If you want to stay in IT, the time to get cloud certified is now. Organizations of all sorts also see pressure to move to the cloud. Cost savings, reduced deployment time, abundant scalability, and ubiquitous access are traditional incentives that have driven cloud adoption from the start. Now, there are other drivers. Competitors that are moving to the cloud, or that are already there may be able to realize those advantages sooner, putting your organization at a disadvantage. More than that, the fact that you need the talent to get to the cloud, and that Cloud IT Pros are in such high demand, makes creating a skilled cloud team that much more difficult. "Although many tech companies and enterprises state they want candidates to have at least a bachelor’s degree, I find that most don’t actually care these days. They see 20 cloud computing jobs chasing one candidate, so it’s a seller’s market." "College is simply no longer a hard requirement for working in technology, including cloud computing. If you get focused training and certifications, you'll find that you're accepted more often than your high school counselor would've told you. I’m not saying a college degree, and the loans that come with it, are worthless. It’s where you learn the fundamentals that give you an advantage in learning specific areas on the job, especially in areas that require understanding connections and patterns like architecture and security." This is good news for traditional IT Pros. There's time, and plenty of focused training options that allow you to get certified, and step into this Cloud IT Pro seller's market. 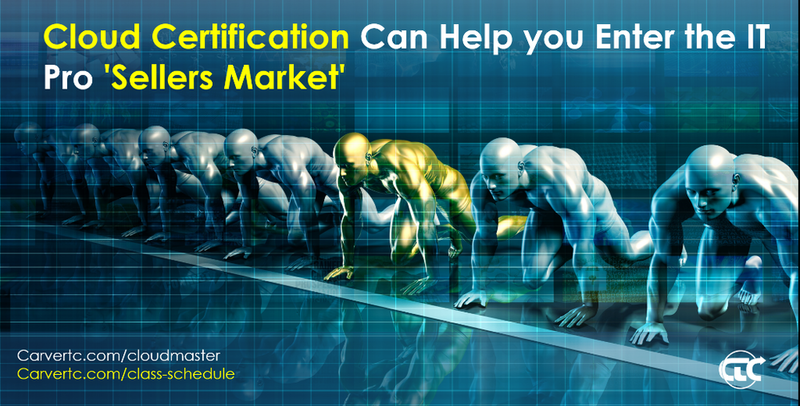 Vendor-specific certifications are in high demand, as they should be. However, with multi-cloud deployments being the defacto standard, and cost management a leading challenge, vendor-neutral IT training and certification, such as CloudMASTER is essential. AWS or Azure training will provide great detail on how to interact with those platforms and services, but will they tell you how to control costs? CloudMASTER offers an entire course on Cloud Operations focused on management and operations, essential training for cloud infrastructure management and optimization. Vendor specific training also won't go into detail about how to evaluate and compare cloud services. The Cloud Technologies class goes into detail about how to read and compare cloud provider Service Level Agreements, and how to think critically about how to integrate cloud solutions from different vendors. And, in addition to providing abundant coverage of cloud security and cloud compliance training topics, CloudMASTER also offers a class dedicated to the role RightScale called out as the key emerging role in cloud IT, the role of Cloud Architect. The Cloud Architect class takes students through the entire process of planning a cloud project, from assembling a team to defining requirements, to comparing vendors, to presenting findings in a way to win project approval. So far this sounds great for IT Pros, but, it's also great for employers. You have IT resources you know and trust. They have historical institutional knowledge. Leverage those resources to create your in-house cloud team. Research shows it can be considerably less costly to train IT staff versus hiring outside talent to get the cloud skills you need. Especially in this Cloud IT Pro sellers marketing. Providing training is a win-win. It keeps your employees' skill up to date, helps them remain competitive, is seen as a benefit, and lets you assemble a great team from resources you already know and trust. "My recommendation if you’re going down the noncollege route is to map out a path for your training. This means not only taking certifications from cloud providers, but also some training around less tactical topics such as cloud architecture, security, and monitoring. Your training path must also include on-the-job training—it is often more important than what you learn from certification and external training. On the job, you must learn to deliver solutions effectively, as well as understand them." With its focus on topics that matter such as cloud vendor evaluation, multi-cloud, cloud operations, and cloud architecture, and providing hands-on experience with over 20 cloud platforms and tools, CloudMASTER is the first cloud it training you should consider for your career, and your organization. Is CloudMASTER Cloud Computing Certification Like MCSE or Network+? As I've talked to more IT Professionals about the CloudMASTER cloud computing certifications, I keep getting asked the same question, "Is this an MCSE type of certification or a Network+ type of certification?" IT pros want job skills that will make their daily and future job tasks easier. They also want to make sure that they're keeping up with technology trends, and making themselves as marketable as possible so that they can move up in their current organization, or get better jobs in other organizations. So where does a cloud computing certification like CloudMASTER fit? Is it the new MCSE or the new Network+? It doesn't replace either, but it does have similarities to both. These certifications are as important to professional development and job advance as each of those, but it doesn't replace either. On top of that, there are components of the CloudMASTER certification that make it uniquely compelling. I'll lay all of that out for you in this article. See this article on the three certifications, the associated classes, what's covered, and who should consider taking them. Similarly to the Network+ certification, the CloudMASTER is vendor neutral cloud computing training and certification. It doesn't focus on a single vendor like Amazon Web Services (AWS), we focus on over 20 platforms, tools, and technologies. Platforms including AWS, Azure, Rackspace Cloud, Heroku, and Digital Ocean. Tools include administration, management and orchestration tools like Chef, and Rightscale. This is important in cloud computing training and certification because multi-cloud implementations are on the rise. And those are just the tools you get hands-on with, many others are discussed in the classes. In addition to the platforms and tools, the certifications cover a broad range planning steps, as well as more complex skills. From security, privacy, and compliance planning, to migration, implementation, and management of cloud services. So, to address the question, are the CloudMaster certifications like Network+? They are, insofar as they are broad and cover a range of common tasks, and challenges that any IT professional will have to face in a cloud project or environment. But Network+ addresses fundamentals. It's often seen by IT pros as an entry level certification. Essentially a first step to landing a IT support job. The CloudMASTER certifications are much more than that. Again, there are three certifications. The most entry level certification is the Cloud Technologist certification. That class and certification are the starting point on the path to CloudMASTER cloud computing certification. The Technologist certification tests on the fundamental tenants of cloud computing, the benefits cloud provides for businesses, and the skills around selecting, and implementing cloud services. The certification also tests on skills for evaluating, and migrating to Software as a Service (SaaS) solutions. The concepts and skills taught in Network+ are truly vendor agnostic. These include fundamental like DNS, communication protocols, network connections and so forth. The concepts and technologies are truly independent of the vendor supplying the hardware, product, or services. The TCP/IP stack works that same on all platforms. Cat5 cable from one vendor plugs into ethernet compatible NICs of other vendors, and DNS works the same way no matter who you buy the service from or if you provide your own DNS. So, while private cloud implementations are growing in popularity, most organizations will be using some public cloud services. That means IT staff will likely be dealing with cloud service vendors. The CloudMASTER certification training classes teach, and the certifications test on real knowledge, and the ability to perform actual cloud computing IT tasks. Hands-on learning with real products is must. So when we were writing the courses, we chose some of the largest, and most popular cloud services providers such as AWS, Azure, and Chef as the vendors we would use to provide that hands-on experience. In this way, CloudMASTER certifications are similar to the MCSE certifications. You will get some general task related questions on exams, you will also likely see questions the rely on specific knowledge and experience working with some of the larger cloud service platforms. Comparing and selecting the best solutionsn based on requirements. Preparing a migration plan to migrate on-premises software to SaaS. Automating cloud administration tasks to implement true elastic scalability in a cloud solution. Designing an Infrastructure as a Service (IaaS) solution down to compute specifications, storage, memory and database to replace on-premises infrastructure. By the way, our CloudMASTER cloud computing classes train on all of these scenarios and more. Check out the class schedule. In this way, CloudMASTER cloud computing certification is similar to some of the advanced MCSE certification exams. You will be tested on how to put all the pieces of the together to create a function, secure, cost effective cloud solution. Integration of multiple cloud services and solutions. Addressing barriers to cloud migration inside your company (it happens more than you think). Using a layered approach for better security (a topic the keeps CIOs up at night). Addressing how to migrate legacy applications to the cloud. Where do the CloudMASTER Cloud Computing Certifications fit? If you're dealing with a lot of Microsoft Server Technologies, the MCSE certification path is still a good career choice. If you're starting out in an IT career, Network+ is, and will remain, one of the foundational certifications. I would say that Cloud Technologist would come right after Network+. In today's business world, if you're in IT, odds are you'll have to work with cloud computing services. It's now fundamental as setting up Internet connectivity. In many cases, accessing cloud services is the reason you're setting up the Internet connection! If you're interested in being a server administrator, Cloud Operations is a must have certification. The applications and servers that you implement and manage will be likely in the cloud. If you want to step up to that top tier, and be able to design cloud networks, hybrid cloud implementations, or private clouds, the Cloud Architecture certification will prove you have the knowledge and critical thinking to succeed. Have you been looking into cloud computing certifications? What have you considered and why? Let me know in the comments.